During autophagy, a newly formed double membrane surrounds its cargo to generate the so-called autophagosome, which then fuses with a lysosome after closure. Previous work implicated that endosomal Rab7/Ypt7 associates to autophagosomes prior to their fusion with lysosomes. Here, we unravel how the Mon1-Ccz1 guanosine exchange factor (GEF) acting upstream of Ypt7 is specifically recruited to the pre-autophagosomal structure under starvation conditions. We find that Mon1-Ccz1 directly binds to Atg8, the yeast homolog of the members of the mammalian LC3 protein family. This requires at least one LIR motif in the Ccz1 C-terminus, which is essential for autophagy but not for endosomal transport. In agreement, only wild-type, but not LIR-mutated Mon1-Ccz1 promotes Atg8-dependent activation of Ypt7. Our data reveal how GEF targeting can specify the fate of a newly formed organelle and provide new insights into the regulation of autophagosome-lysosome fusion. Autophagy is a word derived from the Greek for “self-eating”. It describes a biological process in which a living cell breaks down its own material to release their chemical building blocks that can then be used to make new molecules. Autophagy is often triggered when a cell becomes damaged or when nutrients are in short supply. The hallmark of autophagy is the formation of structures called autophagosomes. These structures capture the cellular material, fuse with other compartments in the cell – namely endosomes in animals and vacuoles in yeast – and then deliver the material inside, ready to be broken down. For an autophagosome to fuse to an endosome or a vacuole, small proteins of the Rab protein family must be located on the surface of the autophagosome. Rab proteins are recruited to this surface by enzymes known as GEFs. However it remains unclear how most GEFs get to the surface of a compartment within the cell to begin with. The Mon1-Ccz1 complex is a GEF that occurs in yeast and animals, including fruit flies and humans. It is found on endosomes, and was recently shown to also localize to autophagosomes. Now, Gao et al. report that, in yeast, the Mon1-Ccz1 complex binds directly to a protein named Atg8. This protein is anchored on to the surface of autophagosomes, and is closely related to other proteins in animal cells. Gao et al. discovered that this specific GEF binds to Atg8 via at least one binding site on its Ccz1 component. This binding site is only needed for the GEF to localize to the autophagosomes; the Mon1-Czz1 complex can still bind to endosomes without it. Blocking the GEF from binding to Atg8 stopped the autophagosomes from fusing with vacuoles. These findings reveal how a GEF can be targeted to two distinct compartments in the cell: endosomes and autophagosomes. Further work is now needed to understand how this process is regulated by the availability of nutrients or damage to the cell, to ensure that autophagy is only triggered under the right conditions. Also, because cancer cells often rely on autophagy to survive, the molecules that regulate this process could represent possible targets for new anticancer drugs. Macroautophagy, called here autophagy, is an important quality control pathway, during which cellular material such as organelles and cytosolic components are engulfed by a double-membrane vesicles, the autophagosome (Shibutani and Yoshimori, 2014; Mizushima et al., 2011). In both yeast and mammals, autophagosome formation is a complex process that begins with the assembly of the phagophore or isolation membrane. Once complete, the autophagosome first fuses with endosomes to form an amphisome and then with lysosomes in mammalian cells, while it directly fuse with the lysosome-like vacuole in yeast (Lamb et al., 2013; Chen and Klionsky, 2011). How autophagosomes become fusion competent with lysosomes is still poorly understood. Like for other fusion events, autophagosome fusion with vacuoles or endosomes requires SNAREs, Rab GTPases (Rabs) and the HOPS tethering complex (Reggiori and Ungermann, 2017; Barr, 2013; Kümmel and Ungermann, 2014). Rabs have a central role in this fusion cascade. They are held soluble in the cytosol by the GDP-dissociation inhibitor (GDI) proteins, which bind GDP-loaded Rabs. Once on membranes, a Rab-specific guanine nucleotide exchange factor (GEF) converts Rabs into their active GTP-form (Barr, 2013). This allows their interaction with effectors such as tethering factors (Kümmel and Ungermann, 2014). The Rab7 GTPase is required for the fusion of endosomes with lysosomes and lysosomal transport (Nordmann et al., 2012). In yeast, the Rab7-homolog Ypt7 binds to the HOPS tethering complex in this process, which in turn supports SNARE assembly and fusion. Rab7 as well as Ypt7 are also required for fusion of autophagosomes with endosomes (Gutierrez et al., 2004; Ganley et al., 2011; McEwan et al., 2015) and detected on autophagosomes (Hegedűs et al., 2016). The conserved Mon1-Ccz1 GEF complex triggers endosomal maturation by activating Ypt7 (or Rab7 in metazoans) primarily on late endosomes (Nordmann et al., 2010; Gerondopoulos et al., 2012; Singh et al., 2014; Cui et al., 2014), but likely also on autophagosomes (Hegedűs et al., 2016). In agreement with this notion, it has been shown that yeast Mon1-Ccz1 is essential for autophagy progression (Wang et al., 2002). As Mon1-Ccz1 can interact with Rab5-GTP, Rab5 may promote Rab7 recruitment to endosomes, possibly with support by the local generation of phosphatidylinositol-3-phosphate (PI-3-P) (Singh et al., 2014; Hegedűs et al., 2016; Cui et al., 2014). It remains unresolved, however, how Mon1-Ccz1 is specifically targeted to autophagosomes to trigger SNARE-mediated fusion (Figure 1A). The SNAREs involved in this event have been implicated in previous studies (Darsow et al., 1997; Fischer von Mollard and Stevens, 1999; Dilcher et al., 2001; Sato et al., 1998; Reggiori and Ungermann, 2017). Mon1-Ccz1 and Ypt7 localize to autophagosomes during starvation. (A) Working model of autophagosome-vacuole fusion. Red lines indicate the involved SNAREs Vam3, Vam7, Vti1, and Ykt6. Ypt7 is shown bound to the HOPS complex. For details see text. (B–H) Localization of Atg8 relative to Ccz1 and Ypt7 during growth and nitrogen starvation. Cells expressing mCherry-tagged Atg8 or GFP-tagged Ccz1 or Ypt7 were grown in YPD (normal, +N) or in synthetic medium without nitrogen (SD-N, labeled as N-starved) for 2 hr and analyzed by fluorescence microscopy and showed via individual slices. Size bar, 5 µm. (F–I) Percentage of Ccz1 puncta (F) or Ypt7 puncta (I) co-localizing with Atg8 under both conditions. Atg8 dots (n ≥ 50), Ccz1 dots (n ≥ 300) and Ypt7 dots (n ≥ 200) were quantified by Image J. Error bars represent standard deviation (SD). (K) Relocalization of Ccz1 during starvation. Time course of mCherry-tagged Vps21 and Atg8 relative to GFP-tagged Ccz1. Error bars represent SD. Atg8 is one of 16 conserved autophagy-related (Atg) proteins, which are essential for autophagosome formation, and it possesses six mammalian homologues (Shpilka et al., 2012). Members of the Atg8/LC3 protein family are conjugated to phosphatidylethanolamine (PE) at the autophagosome membrane, and interact with several Atg proteins via a LC3 interacting region (LIR motif) to control both maturation and fusion (Wild et al., 2014; Nakatogawa et al., 2007; Klionsky and Schulman, 2014; Abreu et al., 2017). Here, we demonstrate that Atg8 recruits the endosomal GEF Mon1-Ccz1 to the pre-autophagosomal structure. 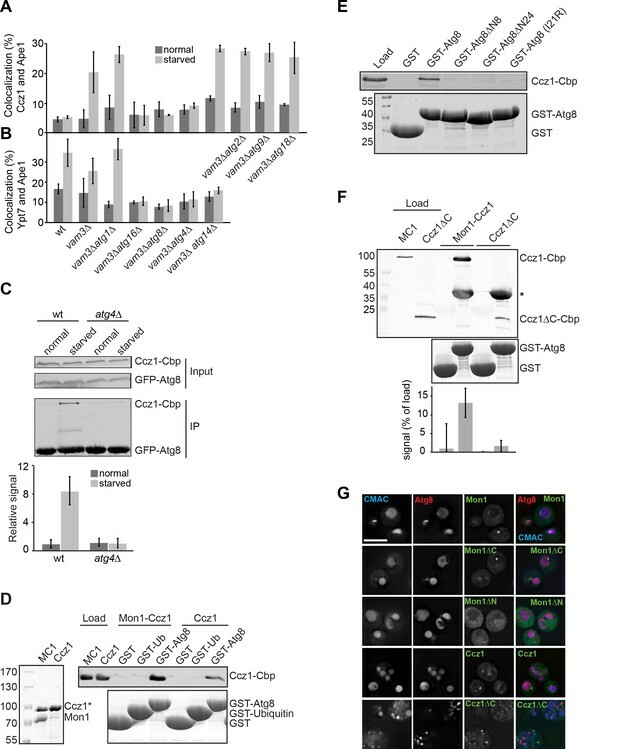 Mutants in a LIR motif present in the Ccz1 C-terminal do not impair GEF activity or endosomal function, but block autophagosome fusion with vacuoles. Our data thus reveal how a GEF can mark two different organelles with the same Rab for fusion via distinct mechanisms. To determine how yeast autophagosomes are specifically decorated with Ypt7, we analyzed the subcellular distribution of both Mon1 and Ccz1 as the GEF complex formed by these two proteins (Nordmann et al., 2010). In particular, we co-localize GFP-tagged Mon1 and Ccz1 with mCherry-tagged Atg8, an autophagosome marker protein (Suzuki et al., 2007), in wild type cells in growing and nitrogen starvation conditions, which induce autophagy. In yeast, autophagosomes form at the pre-autophagosomal assembly site proximal to the ER and vacuole, which is visible as a single dot-like structure by fluorescence microscopy (Klionsky et al., 2016; Graef et al., 2013; Suzuki et al., 2013; Mari and Reggiori, 2010). Ccz1 and Mon1 were found in distinct puncta, likely endosomes (Rana et al., 2015; Nordmann et al., 2010), which were not co-localizing with the Atg8 puncta in nutrient-rich conditions (Figure 1B; Figure 1—figure supplement 1A). After nitrogen starvation, however, Atg8 labeled the vacuole lumen in wild-type cells as expected (Rieter et al., 2013). This made it impossible to localize Ccz1 or Mon1 to autophagosomes under these conditions, because of their rapid fusion with the vacuole upon completion (Geng et al., 2008). We therefore employed different strategies to block fusion of autophagosomes with vacuoles to determine whether Ypt7, Ccz1, and Mon1 transiently co-localize with Atg8. Deletion of the vacuolar Qa-SNARE Vam3, or temperature sensitive mutants of either Vam3 or the HOPS subunit Vps11 block fusion processes with the vacuole (Darsow et al., 1997; Peterson and Emr, 2001). When cells with these mutations were starved, we indeed observed an accumulation of Atg8-positive autophagosomes, and both Ccz1 and Mon1 were markedly co-localizing with them (Figure 1C–E, quantified in F; Figure 1—figure supplement 1B,C). Likewise, a fraction of Ypt7 colocalized with Atg8 in vam3∆ cells only during starvation (Figure 1G–I). In agreement with this, purified autophagosomes contained both Ypt7 and Mon1-Ccz1 on their surface (Gao and Ungermann, in preparation). Furthermore, we analyzed GFP-Ypt7 in cells overexpressing Ape1. Ape1 overexpression results in the formation of a giant Ape1 oligomer, which is too large to be closed by the isolation membrane marked by mCherry-Atg8 (Suzuki et al., 2013). We found that Ypt7 localizes on the cup-shaped isolation membrane concentrated in a dot in wild-type and vam3∆ cells (Figure 1—figure supplement 1). These data support our interpretation that Ypt7 is present on the autophagosomal membrane. To determine whether starvation promotes the redistribution of Ccz1 to autophagosomes relative to endosomes, we monitored Ccz1 co-localization with Atg8 or Vps21, an endosomal marker protein (Cabrera et al., 2013), over time. Indeed, the fraction of Ccz1 in Vps21-positive organelles decreased, while the localization to Atg8-positive puncta increased during the monitored time period (Figure 1K). As recently published (Zhou et al., 2017), we found the vps21∆ mutant displays impaired autophagy as monitored by the processing of initially cytosolic Pho8∆60 in the vacuole lumen (Figure 1—figure supplement 2E). We also noticed that Ccz1 is cytosolic in vps21∆ cells before and after starvation, which did not allow us to detect this protein on autophagosomal structures (Figure 1—figure supplement 2A–D). It is possible that the localization of Mon1-Ccz1 to endosomes is a prerequisite for a later the movement of the GEF complex to autophagosomes during starvation. These data suggest that the Mon1-Ccz1 complex is specifically recruited to autophagosomes. To monitor the potential contribution of Atg proteins, including Atg8, in targeting Mon1-Ccz1 and Ypt7 to autophagosomes, we selected the precursor Ape1 oligomer (Kim et al., 1997), a specific autophagosomal cargo behaving similar to Atg8 under starvation conditions, for a small colocalization screen. In wild-type cells and in agreement with the data obtained using mCherry-Atg8 (Figure 1B,G; Figure 1—figure supplement 1A), the starvation-induced co-localization with Ape1 was observed for Ypt7 but not for Ccz1 (Figure 2A,B; Figure 2—figure supplements 1 and 2). To clarify the contribution of known Atg proteins in this process, we generated double knock out mutants lacking VAM3 and selected ATG genes and repeated the assay. In vam3∆ atg1∆ cells as in vam3∆ cells Ccz1 and Ypt7 both robustly colocalized with Ape1 upon nutrient deprivation (Figure 2A,B; Figure 2—figure supplements 1 and 2). However, all the mutants blocking Atg8 conjugation to PE such as those lacking the components of the conjugation machinery or Atg8 itself, abolished colocalization of Ccz1 and Ypt7 with Ape1. Interestingly, the deletion of Atg14, a subunit of the PI-3-kinase I complex required for autophagy (Kihara et al., 2001), did not impair colocalization of Ccz1 and Ape1 on autophagosomes (Figure 2A; Figure 2—figure supplement 1), though affected Ypt7 colocalization with Ape1 (Figure 2B; Figure 2—figure supplement 2). Colocalization of Ape1 relative to Atg8 was not affected in the atg14 mutant (Figure 2—figure supplement 2). This suggests that PI-3-P is not a main determinant for Mon1-Ccz1 targeting to autophagosomes, though might support its activity and/or recruitment of Ypt7. Atg8 binds to Mon1-Ccz1 via the Ccz1 C-terminal part. (A–B) Atg8 is required for localization of Ccz1 to autophagosomes. Graphs show percentage of colocalization of Ccz1 puncta (A) or Ypt7 puncta (B) relative to Ape1 puncta in wild-type and the different mutants. Cells were grown and analyzed as in Figure 1. Ape1 dots (n ≥ 50), Ccz1 dots (n ≥ 300), and Ypt7 dots (n ≥ 200) were quantified by Image J. Error bars represent SD. (C–E) Interaction analysis of Atg8 with Mon1-Ccz1. (C) Immunoprecipitation of TAP-tagged Ccz1 from wild-type and atg4∆ strain co-expressing GFP-Atg8. The strain was grown in YPD or in SD-N for 3 hr before preparing cell extracts. GFP-Atg8 was subsequently immunoprecipitated using GFP-trap beads. Finally, immunoprecipitates were analyzed by Western blotting against GFP and CbP-tag. The graph is the quantification of three independent experiments, where the interaction observed in unstarved cells from wild-type is set as 1. Error bars are SD. (D) Interaction of Atg8 with Mon1-Ccz1 or purified Ccz1. TAP-tagged proteins (shown as purified proteins on Coomassie stained gels to left) were incubated with GST, GST-ubiquitin, and GST-Atg8 immobilized on GSH-Sepharose. Eluted proteins were resolved by SDS-PAGE and analyzed by Western blotting against the CbP-tag (top) or by Coomassie staining (bottom). Load, 10%. (E) Interaction of Atg8 mutants with Mon1-Ccz1. Analysis was done as in (D) with the indicated GST-tagged Atg8 truncation mutants. (F) Interaction of Mon1-Ccz1∆C with Atg8. Mon1-Ccz1∆C was purified as wild-type and analyzed for interaction with GST-tagged Atg8 as before. Top, Western blot against the CbP tag. A star indicates the additional decoration of GST-Atg8 by the antibody; bottom, Coomassie staining and quantification of three experiments. (G) Requirements of Mon1 and Ccz1 domains for autophagy. The indicated truncations were analyzed in cells expressing mCherry-tagged Atg8. Vacuoles were stained with CMAC, and cells grown in SD-N medium were then analyzed by fluorescence microscopy as in Figure 1B. Size bar, 5 µm. Taken together these observations indicate that Mon1-Ccz1 recruitment onto autophagosome requires Atg8. To determine whether Mon1-Ccz1 binds to Atg8 in vivo, we immunoprecipitated GFP-tagged Atg8 from wild-type and atg4∆ cells co-expressing Ccz1-TAP. Atg4 is required for processing of Atg8 prior to its lipidation on the preautophagosomal structure (Chen and Klionsky, 2011). In agreement with our previous finding, we observed an interaction of Ccz1 with Atg8 in wild-type cells, which was greatly enhanced when cells were starved prior to lysis. In contrast, no interaction was observed in atg4∆, supporting our notion that Ccz1 binds to lipidated Atg8 on autophagosomal structures in vivo (Figure 2C). We next investigated whether Mon1-Ccz1 could bind to Atg8 directly. We thus incubated purified Mon1-Ccz1 with immobilized GST-Atg8 or ubiquitin, and detected robust binding only to Atg8 (Figure 2D). Atg8 recognizes LIR motifs via its N-terminal helices (Klionsky and Schulman, 2014). We therefore tested if truncation mutants of Atg8 lacking the 8 or 24 N-terminal residues still bind Mon1-Ccz1. Importantly, binding was now lost strongly suggesting that Mon1-Ccz1 specific association to Atg8 is mediated by one or more LIR motifs (Figure 2E). To further test whether this interaction depends on the Ccz1 LIR motif(s), we generated an Atg8 I21R mutant, which blocks the binding pocket for the crucial W0 LIR motif residue (Noda et al., 2008). We observed no binding between Atg8 I21R and Ccz1 (Figure 2E), indicating that Atg8 indeed recognizes a LIR motif in Ccz1. This Atg8 mutant functions in non-selective autophagy (Figure 2—figure supplement 3A–C), yet has some defect in selective autophagy when we followed ApeI processing during starvation (Figure 2—figure supplement 3D). It thus behaves like previously characterized mutants at this site (Noda et al., 2008). We then asked which part of Mon1-Ccz1 binds to Atg8. Mon1 and Ccz1 interact with each other via their conserved longin domains (Nordmann et al., 2010; Cabrera et al., 2014), which form a common interface that is required for specific Ypt7 activation (Kiontke et al., 2017). However, Mon1 has some additional 150 residues at the N-terminus of its longin domain, and both Mon1 and Ccz1 have C-terminal domains, whose structure and function is so far unresolved. We therefore generated N- and C-terminal truncation mutants of both proteins and monitored localization and autophagy. 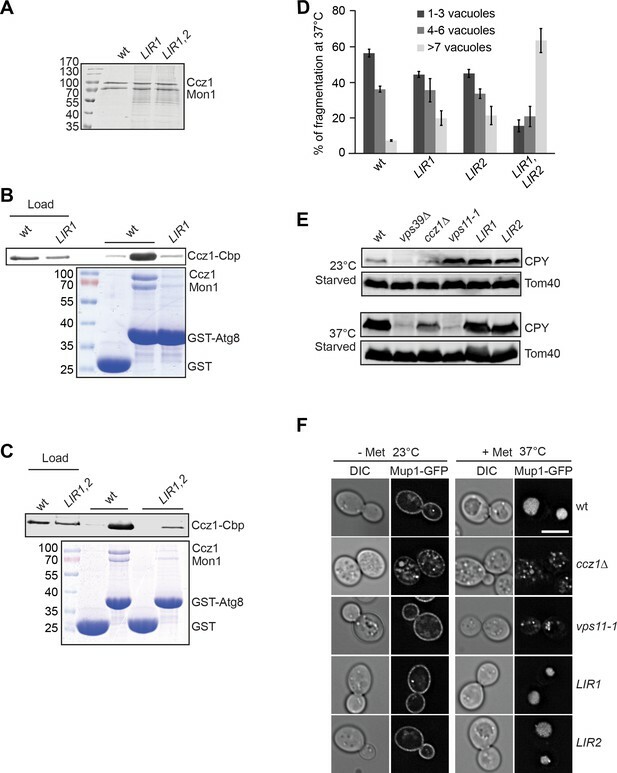 In starvation conditions, GFP-tagged truncation mutants of Mon1 expressed in the mon1∆ background did not impair vacuole morphology or starvation-induced Atg8 trafficking to the vacuole lumen (Figure 2G). We noted though that GFP-Mon1 localization was more strongly impaired in the N-terminal than the C-terminal truncation. In contrast, deletion of the C-terminal domain of GFP-tagged Ccz1 resulted in fragmented vacuoles, even though Ccz1 was still localized to distinct puncta that did not co-localize with Atg8 (Figure 2G). We thus asked whether Ccz1 alone might be able to directly interact with purified Atg8. Although purified Mon1-Ccz1 as well as Ccz1 alone were able to bind GST-Atg8 (Figure 2D), a mutant complex of Mon1 with Ccz1∆C showed strongly reduced interaction (Figure 2F). Altogether, these observations suggest that the C-terminal part of Ccz1 directs the GEF complex to Atg8-positive autophagosomes. To determine the direct binding site in the Ccz1 C-terminal, we compared the C-termini of multiple Ccz1 homologs. As metazoan Ccz1 is shorter than yeast Ccz1, we narrowed our search on the conserved fragment and identified the putative LIR motifs (https://ilir.warwick.ac.uk; Figure 3A). We generated the corresponding mutants by changing the aromatic W0 and the hydrophobic L4 residues into alanines. Among the nine mutants (Figure 3A), two showed impaired GFP-Ccz1 localization to mCherry-Atg8-positive autophagosomes under nitrogen starvation conditions, that is Y236A V239A (named LIR1) and Y445A L448A (LIR2) (Figure 3B,C,E). These two motifs are highly conserved across species (Figure 3B). However, we noticed that trafficking of mCherry-tagged Atg8 to the vacuole was not totally compromised in the single mutants at normal growth temperature (Figure 3C). We therefore combined both mutations and nitrogen starved the cells. This resulted in a complete block of autophagy in the double mutant as shown by defects in Atg8 delivery and processing in the vacuole (Figure 3C and F), but also vacuole morphology (Figures 3C and 4D). Under these conditions, numerous mCherry-Atg8-positive autophagosomes accumulated in the cytoplasm, consistent with a defect in fusion with vacuoles. The LIR1,2 mutant behaves thus as the Ccz1∆C mutant, and is likewise compromised in both autophagy and vacuole biogenesis in general (Figures 2F and 3C,F). Identification of the LIR motifs in Ccz1 required for function. (A) Schematic representation of potential LIR motifs of the C-terminal part of Ccz1. Blue and red indicates all LIR motifs analyzed, red the motifs that also impair Ccz1 localization. (B) Alignments of the potential Ccz1 LIR motifs Mm: Mus musculus, Hs: Homo sapiens, Cg: Candida glabrata, Lt: Lachancea thermotolerans, Nd: Naumovozyma dairenensis, Ka: Kazachstania Africana. 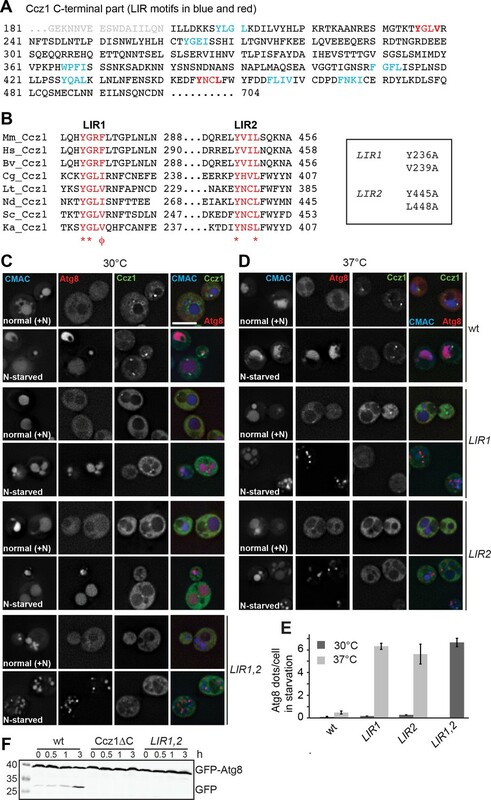 (C–D) Effect of LIR mutants on localization, autophagy and vacuole morphology. Analysis was done as in Figure 1B–H. CMAC staining was done for 15 min before analysis. Cells were grown either at 30°C or 37°C during growth or starvation. Size bar, 5 µm. (E) Quantification of Atg8 dots per cell from images in (C–D). Error bars represent SD. (F) Analysis of autophagy over time. Cells were grown at 30°C and incubated in starvation medium for the indicated time periods, then harvested, and proteins were analyzed by SDS-PAGE and Western blotting against GFP. LIR motifs in Ccz1 are required for Atg8 binding, but not for the endocytic pathway. (A–C) Interaction of Ccz1 LIR mutants with Atg8. (A) Analysis of purified Mon1-Ccz1 wild-type and mutant complex by SDS-PAGE and Coomassie staining. All of strains were grown at 30°C for purification. (B–C) Mutations in the LIR motifs impair Mon1-Ccz1 interaction with Atg8. Interaction analysis was done as in Figure 2D, and proteins were analyzed by Western blotting (top) and Coomassie staining (bottom). (D) Comparison of vacuole morphology in LIR mutant cells. Cells were grown at 30 or 37°C in starvation medium, and vacuoles were then stained with CMAC. The number of vacuoles per cell was quantified as indicated. Error bars, SD. (E) Effect of LIR mutants on sorting of vacuolar hydrolases. The indicated cells were grown in starvation medium at the indicated temperature for 2 hr. Total cell lysates were generated and proteins were resolved on SDS-PAGE. Western blots were decorated against CPY and Tom40 (as loading control). (F) Endocytosis analysis in LIR mutants. The indicated cells expressing Mup1-GFP were grown in the absence (-Met) of methionine in minimal medium to an OD600 of 1.0 at the 23°C. Where indicated, methionine was added after the temperature shift to 37°C, and cells were analyzed by fluorescence microscopy after 1 hr. Size bar, 5 µm. We therefore focused on the single mutants. We were wondering why the single LIR mutants were still functional, even though Ccz1 targeting seemed diminished. We considered the possibility that the LIR mutants may be impaired at higher temperature, and thus repeated the starvation assay at 37°C (Figure 3D). Although the wild-type cells were functional in autophagy, both LIR mutants now accumulated Atg8-positive autophagosomes in cells (Figure 3D, quantified in E). To test if these LIR mutants indeed compromise binding to Atg8, we produced and used the mutants in Atg8 binding assays (see Figure 2D–F). Both LIR1 and the LIR1,2 double mutants could be purified as wild-type Mon1-Ccz1 from yeast, indicating that they were not destabilizing the complex (Figure 4A). However, they showed poor interaction with Atg8 (Figure 4B,C). As we encounter major problems in the purification of the Mon1-Ccz1 complex with LIR2, we did not further pursue it in our in vitro analyses. Nonetheless, these data agree with a model, where one and possibly two Ccz1 LIR motifs are required for the recruitment of Mon1-Ccz1 to Atg8. Our data suggest an important function of the one and possibly two LIR motifs in directing Mon1-Ccz1 to autophagosomes. As vacuole morphology of the LIR1 and LIR2 mutants was only mildly impaired during heat stress (Figures 3D and 4D), we asked if endosomal trafficking was functional in these mutants. The vacuolar hydrolase carboxypeptidase Y (CPY), which is normally sorted from the Golgi via the endosome to the vacuole, is lost from cells in mutants impaired in vacuole biogenesis such as vps39∆ or the temperature sensitive mutant vps11-1 at 37°C (Figure 4E). Likewise, ccz1∆ cells have less intracellular CPY. However, both LIR mutants in Ccz1 were entirely unperturbed also at elevated temperature or when cells were starved. As a second assay, we traced the sorting of the methionine transporter Mup1 from the plasma membrane to the vacuole (Arlt et al., 2015). In both wild-type cells and the LIR mutants, Mup1-GFP was mainly at the plasma membrane in the absence of methionine, but was efficiently sorted to the vacuole lumen when methionine was added after the temperature shift to 37°C (Figure 4F). This sorting remained unaffected at higher temperatures as well. We therefore conclude that the LIR1 and LIR2 mutants selectively disable Mon1-Ccz1 targeting to autophagosomes, whereas endosomal function of Mon1-Ccz1 remains unperturbed under the same conditions. Our data imply that Atg8 is indeed a primary determinant to recruit Mon1-Ccz1 to autophagosomes. We used our Mon1-Ccz1 LIR1 mutant to directly test this hypothesis as this was the best behaving complex. From previous in vitro experiments with purified organelles and proteins we have learned that mutations can compromise protein function in vitro much more clearly than in vivo (Bröcker et al., 2012; Ungermann et al., 1999). We therefore took advantage of GEF assay that we developed before to monitor Mon1-Ccz1 activity on membrane-bound Ypt7 (Cabrera et al., 2014). C-terminally His-tagged Ypt7 was preloaded with the MANT-GDP nucleotide, which looses fluorescence when exchanged for non-fluorescent GTP. In the presence of liposomes carrying the His-interacting DOGS-NTA lipid, and the nucleotide exchange reaction is strongly enhanced when Mon1-Ccz1 is also recruited onto the liposome surface (Cabrera et al., 2014). Using this assay, we compared wild-type and LIR1 mutated Mon1-Ccz1 complex (Figure 5A). Both complexes had similar activity for Ypt7 (Figure 5A,D). We then lowered the Mon1-Ccz1 concentration in our assay to test whether Mon1-Ccz1 targeting and function could depend on membrane-bound Atg8. Indeed, membrane-targeted Atg8-His, but not soluble Atg8, stimulated the GTP exchange reaction (Figure 5B,D), presumably due to its ability to recruit the GEF complex to membranes. In contrast, the Mon1-Ccz1 LIR mutant did not respond to the addition of Atg8 (Figure 5C,D). Our data thus show that membrane-bound Atg8 can recruit Mon1-Ccz1 to membranes to promote Ypt7 activation. Functional reconstitution of Atg8-dependent GEF activity of Mon1-Ccz1. (A) GEF activity of wild-type and mutant Mon1-Ccz1 complex. GEF activity was monitored by displacement of MANT-GDP from Ypt7 using a microplate reader (see Materials and methods). Assay was carried out with liposomes capable of binding His-tagged Ypt7 (Cabrera et al., 2014). Without GTP, blue line; without GEF, black line; wt refers to different concentrations of Mon1-Ccz1, LIR1 to the Mon1-Ccz1 mutant complex. (B–D) Effect of membrane-bound Atg8 or soluble Atg8 on GEF activity. Analysis was carried out as in (A) with reduced Mon-Ccz1 concentrations and upon addition of His-tagged Atg8 at the indicated concentrations. (E) Quantification of the rate constants of wild-type and mutant Mon1-Ccz1 complex in the presence and absence of Atg8 for Figure 5B–C. Rate constants were calculated based on the initial slope of the GEF curve (n = 3) (Kiontke et al., 2017; Langemeyer et al., 2014). Error bars, SD. (F) Model of Mon1-Ccz1 recruitment to the autophagosome and endosomes. For details see text. Previous studies showed that artificial redirection of GEFs can redirect different Rabs to other membranes (Blümer et al., 2013; Gerondopoulos et al., 2012), yet the molecular determinants that target GEFs to their correct membrane are only partially known and rarely experimentally validated. Autophagosomes form de novo and finally fuses with lysosomes (Reggiori and Ungermann, 2017). Like maturing endosomes, autophagosomes need to acquire the machinery to allow their fusion with lysosomes, including the Rab7/Ypt7 GTPase. Here we have uncovered a simple molecular mechanism that specifically targets the GEF Mon1-Ccz1 onto the surface of autophagosomes. The Ccz1 subunit has at least one conserved C-terminal LIR motif, which directly binds to the LC3 homolog Atg8. Once on autophagosomes, Mon1-Ccz1 recruits and activates the Rab7-like Ypt7 from the cytosol, which in turn can bind the HOPS tethering complex to trigger SNARE-mediated fusion. We indeed found recent evidence that Mon1-Ccz1 is sufficient to activate Ypt7, which was provided in a soluble complex with GDI, and thus triggered fusion in a reconstituted assay (Langemeyer et al., 2018). Similarly, the TRAPP GEF complexes could activate their corresponding Rab-GDI complexes on membranes (Thomas and Fromme, 2016). In agreement with this interpretation, only wild type but not LIR-mutated Mon1-Ccz1 strongly promotes Ypt7 activation in the presence of membrane-localized Atg8 (Figure 5E). Our data imply that lipidated Atg8 is a specific determinant to redirect Mon1-Ccz1 to autophagosomes. In addition to Atg8, PI-3-P may support re-localization to both endosomes and autophagosomes (Hegedűs et al., 2016; Cabrera et al., 2014). Indeed, deletion of Atg14 in Drosophila fat cells appears to affect autophagosome fusion in addition to altering the biogenesis of these vesicles (Hegedűs et al., 2016). The generation of autophagosomal PI-3-P is required for multiple events, including efficient Atg8 lipidation (Shibutani and Yoshimori, 2014). Interestingly, Mon1-Ccz1 localization to Atg8 positive dots was not impaired if synthesis of the autophagosome-specific PI-3-P pool was blocked by atg14 deletion (Figure 2C). We consider it therefore unlikely that PI-3-P synthesis is a primary factor for Mon1-Ccz1 localization to autophagosomes. In contrast, our analysis suggests that PI-3-P may be critical for Mon1-Ccz1 activity, which could explain the defect in Ypt7 localization to autophagosomes of the atg14Δ mutant. Alternatively, PI-3-P might directly support the recruitment of Ypt7, even though we have evidence that Mon1-Ccz1 activity is most critical in this process (Langemeyer et al., 2018). How the reported PI-3-P binding (Lawrence et al., 2014; Cabrera et al., 2014) affects Mon1-Ccz1 function needs to be further dissected. Future studies will also need to explore how Mon1-Ccz1 is timely and spatially recruited to autophagosomes. Importantly, our study reveals that Mon1-Ccz1 is functional in the endocytic pathway, when its LIR motifs are singularly mutated. This provides further evidence that Mon1-Ccz1 has a dual role and two different targeting mechanisms for two distinct organelles. By identifying the LIR mutants, we established one of the few conditions that might accumulate fully assembled autophagosomes, which are incompetent of fusing with vacuoles, while maintaining endosome-vacuole fusion and thus vacuoles functional. In mammalian cells, additional proteins such as PLEKHM1 (McEwan et al., 2015) have been identified as factors involved in the fusion between autophagosomes and lysosomes. Interestingly, PLEKHM1 directly binds LC3-like proteins and Rab7, and could thus support HOPS-mediated tethering and fusion of autophagosomes with lysosomes. We believe that GEFs such as Mon1-Ccz1 are the most critical factors to confine Rab localization and thus determine organelle identity. The cooperation with LC3-like proteins could then provide a combinatorial code to target GEFs and additional fusion factors to autophagosomes. Interestingly, Atg8 is not homogenously distributed over the surface of forming autophagosomes (Graef et al., 2013), and could potentially cluster fusion factors to facilitate their cooperation during fusion. How Atg8 recycling and fusion are then coordinated (Abreu et al., 2017), it is yet another exciting riddle to be dissected. At least Mon1-Ccz1 localization to autophagosomes might be dispensable, once Rab7/Ypt7 is recruited and bound to HOPS. Recent work of us and others revealed that GEFs can recruit Rab GTPases from the GDI complex to membranes (Langemeyer et al., 2018)(Thomas and Fromme, 2016). The identification of Atg8 as a determinant for Mon1-Ccz1 localization to autophagosomes provides the first example of how a GEF can be diverted to a different location. Differential spatiotemporal recruitment of GEFs allows cells to operate distinct pathways, such as autophagy and endosomal maturation, depending on their metabolic needs while employing the same machinery. For endosomal localization, Rab5-GTP has been suggested as a Mon1-Ccz1 interactor based on yeast-two-hybrid interactions (Li et al., 2015; Cui et al., 2014; Singh et al., 2014; Kinchen and Ravichandran, 2010). Future studies will need to dissect if this order of events can be indeed recapitulated in vitro and how further endosomal and autophagosomal factors specify GEF localization. Strains and plasmids used in this study are listed in Supplementary file 1 and 2, respectively. Deletions and tagging of genes were done by homologous recombination of respective PCR fragments (Janke et al., 2004; Puig et al., 1998). Mon1 and Ccz1 mutants were generated by QuikChange mutagenesis (Stratagene, La Jolla, CA). Mon1 and Ccz1 truncation mutants have been published (Kiontke et al., 2017). Plasmids encoding GST-Atg8 and Atg8-His6 were kindly provided by Ivan Dikic (Goethe University School of Medicine, Frankfurt am Main, Germany), and Sascha Martens (University of Vienna, Austria), respectively. Tandem affinity purification was performed as described (Bröcker et al., 2012; Lürick et al., 2017). Six liters of culture in YPG were grown at 30°C to OD600 of 6, and cells were harvested and lysed in lysis buffer (300 mM NaCl, 50 mM HEPES-NaOH, pH 7.4, 1.5 mM MgCl2, 1 × FY protease inhibitor mix (Serva, Germany), 0.5 mM PMSF and 1 mM DTT). Lysates were centrifuged for 1 hr at 100,000 g, and the cleared supernatant was incubated with IgG Sepharose beads (GE Healthcare, Penzberg, Germany) for 2 hr at 4°C. Beads were collected by centrifugation at 800 g for 2 min, and washed with ice cold 15 ml lysis buffer containing 0.5 mM DTT and 10% glycerol. Bound proteins were eluted by TEV cleavage overnight at 4°C. Purified proteins were analyzed on SDS-PAGE. Atg8 was purified from E. coli BL21 (DE3) Rosetta cells. Cells were grown to an OD600 of 0.6 and induced with 0.5 mM IPTG overnight at 16°C. Cells were lysed in lysis buffer (50 mM HEPES/NaOH, pH 7.5, 150 mM NaCl, 1 mM PMSF, 1x protease inhibitor cocktail (1x = 0.1 mg/ml of leupeptin, 1 mM o-phenanthroline, 0.5 mg/ml of pepstatin A, 0.1 mM Pefabloc)). Lysates were centrifuged for 20 min at 30,000 g, and the cleared supernatant was incubated with Glutathione Sepharose (GSH) beads (for GST-tagged proteins) or Ni-NTA beads (for His-tagged proteins) for 1 hr at 4°C on a nutator. Beads were washed with 20 ml cold lysis buffer (GSH-beads) or lysis buffer containing 20 mM imidazole (Ni-NTA beads). Bound proteins were eluted with buffer containing 15 mM reduced glutathione (GSH-beads) or buffer containing 300 mM imidazole (Ni-NTA beads). Buffer was exchanged to 50 mM HEPES/NaOH, pH 7.4, 150 mM NaCl, and 10% glycerol by using a NAP-10 column (GE Healthcare, Penzberg, Germany). 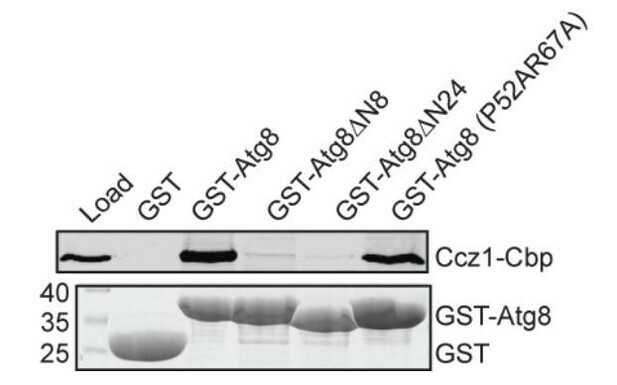 To perform GST pull down binding assays, GST or GST-fused Atg8 wild type or Atg8 mutants or ubiquitin were used as bait, and Mon1-Ccz1 was used as a prey. GST or GST-tagged proteins (150 µg) were simultaneously incubated with GSH-beads for 1 hr at 4°C on a rotating wheel. Beads were washed three times with buffer (150 mM NaCl, 50 mM HEPES/NaOH, pH 7.4, 1.5 mM MgCl2, 0.1% NP-40), and the GSH-bound proteins were then incubated with Mon1-Ccz1 (25 µg) for 2 hr at 4°C on a rotating wheel. Beads were again washed three times in buffer. Bound proteins were eluted by boiling in SDS-sample buffer, resolved on SDS gels, and either analyzed by Coomassie Blue staining or immunoblotting with anti-CbP antibodies (Lürick et al., 2017). Yeast cells were first cultured in YPD media to log phase, and then switched to synthetic minimal medium lacking nitrogen (SD-N) for the indicated times to induce starvation. For CMAC staining of vacuoles, cells were incubated with 0.1 CMAC for 15 min at 30°C and subsequent washed with medium. Cells were imaged on a Deltavision Elite imaging system based on an inverted microscopy, equipped with 100x NA 1.49 and 60x NA 1.40 objectives, a sCMOS camera (PCO, Kelheim, Germany), an InsightSSI illumination system, and SoftWoRx software (Applied Precision, Issaquah, WA). Stacks of 6 or 8 images with 0.2 µm spacing were taken for constrained-iterative deconvolution (SoftWoRx) and quantification. GEF assays were performed as described (Nordmann et al., 2010; Cabrera et al., 2014). 60 pmoles Atg8-His were incubated with 60 µl multilamellar vesicles (MLVs, 15 mM) of the following composition (palmitoyloleoyl phosphatidylcholine, 84 mol%, palmitoyloleoyl phosphatidylcholine 10 mol%, DOGS-NTA (1,2-dioleoyl-sn-glycero-3-[(N-(5-amino-1-carboxypentyl)iminodiacetic acid)succinyl]), 6 mol%) for 15 min at 25°C. 500 pmoles Ypt7-His were preloaded with MANT-GDP, and incubated with MLVs for 5 min at 25°C before addition of the Mon1–Ccz1 complex. MANT fluorescence was detected in a SpectraMax M3 Multi-Mode Microplate Reader (Molecular Devices, Germany). Samples were excited at 355 nm and fluorescence was detected at 448 nm. After 20–30 min, 0.1 mM GTP was added to trigger the exchange reaction. The decrease of MANT-GDP fluorescence is an indicator of nucleotide exchange. Yeast cells (carry the plasmid pRS315-CUP1pr-BFP-APE1) were grown overnight in SDC-LEU medium, then diluted to early log phase next morning. 250 µM CuSO4 was added to induce the giant Ape1 oligomer formation for 4 hr, and cultures were then switched to SD-N medium containing 250 µM CuSO4 for 1 hr to induce autophagy. Review series: Rab GTPases and membrane identity: causal or inconsequential? The Journal of Cell Biology 202:191–199. Journal of Biological Chemistry 288:5166–5175. Journal of Cell Science 127:1043–1051. Journal of Cell Science 124:161–170. The Journal of Cell Biology 138:517–529. The Journal of Biological Chemistry 276:34537–34544. Molecular Biology of the Cell 10:1719–1732. The Journal of Cell Biology 182:129–140. Molecular Biology of the Cell 27:3132–3142. The Journal of Cell Biology 152:519–530. The Journal of Cell Biology 137:609–618. Current Opinion in Cell Biology 29:61–66. Journal of Biological Chemistry 293:731–739. Molecular Biology of the Cell 25:1608–1619. Molecular Biology of the Cell 28:322–332. Atg9 reservoirs, a new organelle of the yeast endomembrane system? 132–143, Role of Rab7/Ypt7 in Organizing Membrane Trafficking at the Late Endosome, Rab GTPases and Membrane Trafficking. Molecular Biology of the Cell 26:2535–2549. Journal of Molecular Biology 429:486–496. Journal of Cell Science 126:593–604. Molecular and Cellular Biology 18:5308–5319. Journal of Cell Science 125:2343–2348. The Journal of Cell Biology 215:499–513. The Journal of Cell Biology 145:1435–1442. Journal of Biological Chemistry 277:47917–47927. Thank you for submitting your article "Molecular mechanism to target the endosomal Mon1-Ccz1 GEF complex to autophagosomes" for consideration by eLife. Your article has been reviewed by three peer reviewers, one of whom is a member of our Board of Reviewing Editors, and the evaluation has been overseen by Vivek Malhotra as the Senior Editor. The reviewers have opted to remain anonymous. This manuscript describes the mechanism how the Mon1-Ccz1 GEF complex localizes to autophagosomes. The authors show that Mon1-Ccz1 is recruited to autophagosomes by interaction with Atg8. Two putative LIR motifs are present in the C-terminal region of Ccz1. Mutagenic analysis of these LIR motifs suggests that the Ccz1-ATG8 interaction is important for autophagosome-lysosome fusion but not for endocytosis. Finally, using an in vitro GEF system, the authors show that recruitment of Mon1-Ccz1 by membrane-bound Atg8 can promote Ypt7 activation. This study reveals a novel mechanism of recruitment of the Rab protein to autophagosomes and the data are mostly convincing. However, to fully support the authors' conclusion, the following issues need to be addressed. 1) The authors suggest that the endocytic pathway is not affected in Ccz1-LIR mutant cells at 37oC. However, this is not fully convincing from the data. In Figure 4E, is the 2 h-long incubation at 37oC sufficient for degradation of preexisting CPY? Otherwise, it is difficult to detect a reduction in the amount of CPY after the temperature shift. What is the half-life of CPY? Also, to strictly follow the fate of Mup1 at 37oC in Figure 4F, methionine should be added after the temperature shift. These pieces of information are critical to prove that the mutation in the LIR sequence of Ccz1 specifically impairs its interaction with Atg8 without affecting its general function. 2) Related to above criticism, the importance of the Atg8-Ccz1 interaction can also be tested by introducing mutations in the LIR-binding pocket in Atg8 (e.g., P52A/R67A mutation). Autophagosomes, if normally generated, should accumulate in these mutant cells. 3) Whether Ypt7 is present on autophagosomes or vacuoles (or both) is controversial. This is not carefully addressed in this study. The punctate structures on the vacuolar rim could represent either the PAS/ autophagosomes or a domain of the vacuolar membrane. In fact, in the review article by the authors (J Mol Biol (2017) 429:486), a "?" mark is added to Ypt7 on autophagosomes. Has this been already proved elsewhere? In not, the presence of Ypt7, Ccz1, and Mon1 on the autophagosomal side should be determined in more depth, for instance by biochemical methods (e.g., by purification of autophagosomes) or immunoelectron microscopy. It is also ideal to show that the Ccz1 complex is present on the outer membrane, not inside, of autophagosomes. 4) In Figure 2A, normal colocalization of Ccz1 with Ape1 in atg14 mutant cells is interesting and rather surprising. Is Atg8 also colocalized with Ape1 in the atg14 mutant? Is there an Atg8-independent mechanism of Ccz1 targeting? In any case, the author should show actual images for Figure 2A and B (or in Supplemental Figures). It is also important to check the Ccz1-Ape1 colocalization in other atg mutants. Given the involvement of PI3K and potential link of Ccz1-Mon1/Ypt7 with endosomes, at least, atg2d, atg18d, and atg9d mutants should be added. 5) It is also important to test the possibility that Rab5 could be involved in the regulation of the PAS pool of Mon1-Ccz1 and Ypt7. 6) The interaction between Mon1-Ccz1 and Atg8 is not demonstrated in vivo. In particular, it is not clear whether this interaction is influenced by the lipidation status of Atg8. The authors should perform co-immunoprecipitation of endogenous proteins and pay attention to differentiate the two forms of Atg8. Thank you for submitting your revised article "Molecular mechanism to target the endosomal Mon1-Ccz1 GEF complex to autophagosomes" for consideration by eLife. Your article has been reviewed by three peer reviewers, one of whom is a member of our Board of Reviewing Editors, and the evaluation has been overseen by Vivek Malhotra as the Senior Editor. The reviewers have opted to remain anonymous. The revised manuscript has been substantially improved. Notably, the status of endocytic traffic and the role of PI3K are now clearer. However, despite the addition of these new data, this manuscript still contains some critical problems and the responses to the previous criticisms/comments are not sufficient. 1) The authors used the Atg8 I21R mutant instead of the P52A/R67A mutant to disrupt LIR-dependent interactions. However, characterization of the I21R mutant is missing. How does this mutation affect the substrate binding? Does it affect other functions of Atg8 besides substrate binding? Is there any previous study that used this mutant (if so, please cite it)? Furthermore, the authors did not determine whether autophagosomes accumulate in I21R mutant cells. This experiment is critical to rule out the possibility that Ccz1 LIR mutations affect other functions of the protein that are unrelated to Atg8-binding. 2) Whether Ypt7 is present on the autophagosomal membrane is one of the main issues of this study because the authors propose that Mon1-Ccz1 activates Ypt7 on autophagosomes. Additionally, in the Abstract, the authors state that "previous work implicated that endosomal Rab7/Ypt7 associates to autophagosomes prior to their fusion with lysosomes", but they do not specify which studies have suggested this. So far, the evidence that Ypt7 is on the autophagosomal membrane has been very limited. The authors show that Ypt7 colocalizes with Atg8 in vam3Δ cells, but it is unclear how they have ruled out the possibility that this represents tethering of an Atg8-positive autophagosome with Ypt7 on the vacuolar membrane. In the rebuttal letter, the authors claim that the amount of Ypt7 on the autophagosome is too small to be detected by immuno-EM. However, given that the fluorescent Ypt7 signals are clearly detected by IF (Figure 1G and H), the authors could try immuno-EM a try. Alternatively, the authors may consider looking for large autophagosomes that can be clearly separated from the vacuole by immunofluorescence microscopy. 3) The authors' interpretation of Rab5-related data is self-contradictory. On one hand, they wanted to dismiss a role of Vps21 in autophagy (more on this later). On the other hand, they showed that Ccz1 dots were gone in vps21D. It is the authors' own claim that some Ccz1 dots are with Atg8, and acting to trigger Ypt7. With all Ccz1 dots gone (probably just too weak to be detected), one should actually expect defects in autophagy. While I acknowledge that subtle differences in strain background and experimental conditions might lead to some discrepancy, I'd be surprised that diminished recruitment of Ccz1 to autophagic membrane produces zero effect on autophagy (if so, what is the point of this manuscript?). The more rational interpretation is that vps21D only produces a partial kinetic defect (there are 3 genes in Rab5 family). In fact, the Cherry-Atg8 construct the authors used is not the ideal tool to assess partial defects (it functions substantially worse than GFP-Atg8, see Autophagy. 2015 Jun 3;11(6):954-60.) If the author really wants to dismiss vps21, they should at least use the quantitative Pho8D60 assay. My suggestion here is that they simply acknowledge that Vps21 (and by extension the Rab5 family) has a regulatory role in Ccz1 targeting, and revise their model and conclusions. 4) We suggested the authors to check the interaction of Ccz1 with Atg8 in vivo, and clarify whether Ccz1 preferentially interacts with the lipidated form of Atg8. It appears that the authors have completely missed the latter part. Demonstrating a stronger interaction (Figure 2C) after starvation is totally irrelevant to the question as to whether lipidated Atg8 is the interactor. A potential technical issue is that the authors used GFP-Atg8 with a large tag, which makes it tricky (though not impossible) to discern the two forms. This can be resolved by using something like 3HA-Atg8. Researchers generally tend to believe that lipidated Atg8 is the critical factor in autophagy. It is likely the case here, even though the authors' in vitro experiment didn't directly address it either. That is why it is worth clarifying the interaction, especially considering that it is a very simple experiment. Imagine if the result turned out otherwise; the model would be quite different. We thank the reviewers for these important points. The half-life of CPY is 33.5 min. We took an additional control (the vps11-1 temperature-sensitive strain, which impairs HOPS function in fusion at the vacuole) for the CPY assay to show that a 2h incubation at 37°C is sufficient to degrade preexisting CPY (Figure 4F). Furthermore, to show that the LIR sequence of Ccz1 does not affect its general function in the endocytic pathway, we added methionine after the temperature shift. Indeed, the LIR sequence of Ccz1 exclusively impairs autophagy, but not its endolysosomal function (Figure 4E). Likewise, vacuole morphology was comparable to wild-type under these conditions. We agree with the reviewers that the interaction between Atg8 and Mon1-Ccz1 should be addressed in more detail. Therefore, we performed pull-down assays to test the interaction of Mon1-Ccz1 with two Atg8 mutants, the P52A R67A mutant and a second mutant (I21R), where we expected a direct impairment based on previous binding and structural studies. We now demonstrate that the interaction is weakly impaired by the P52A R67A mutant, but completely deficient in the Atg8 I21R mutant (Figure 2E). As the I21R mutant shows that the positive charge now specifically impairs binding to Ccz1, in agreement with a direct LIR motif interaction, we included this result in the manuscript and show the double mutant, which based on structural considerations should only affect a subset of LIR motifs, here only in Author response image 1 for the reviewer. Interaction of Atg8 mutants with Mon1-Ccz1. incubated with GST, GST-Atg8 and Atg8 mutants immobilized on GSH-Sepharose. Eluted proteins were resolved by SDS-PAGE and analyzed by Western blotting against the CbP-tag (top) or by Coomassie staining (bottom). Load, 5% (see Author response image 1). We agree with the reviewers that the localization of Ypt7 to autophagosomes is not demonstrated biochemically, but only by colocalization experiments. Yet our combined data along this line support the notion of a Mon1-Ccz1-dependent colocalization of Ypt7 with autophagic protein markers when autophagosome fusion with the vacuole is blocked (Figure 2). The pool of endogenous Ypt7 on autophagosomes is too low to be detected by immune EM-based techniques. For the endocytic pathway, we had to massively overproduce Ypt7 to find it on endosomes (Hönscher et al., 2014). We are currently working on a parallel study, where we started to address the fusion of autophagosomes with vacuoles. In this context, we established a protocol for autophagosome purification. Within this study, we conducted a proteinase K protection assay of purified autophagosomes and could show that both Mon1-Ccz1 and Ypt7 are present on the outer membrane of autophagosomes. We present the data in this response letter to the reviewer, (Author response image 2) yet would like to present them in the context of our next study. We hope that the reviewers will agree with this. Nonetheless, we have added a sentence to the manuscript where we refer to this finding. Biochemical Method for Obtaining an Autophagosome-enriched Fraction. (A) Scheme of the purification of autophagosomes from yeast. (B) Total cell lysates from cells grown in YPD medium and starved in SD-N medium for 3 hours. The 15,000 g pellet (P15) fraction from vam3Δ (Atg9-3xFlag, GFP-Atg8) were subjected to density gradient centrifugation and incubated with flag beads to pull down autophagosomes. 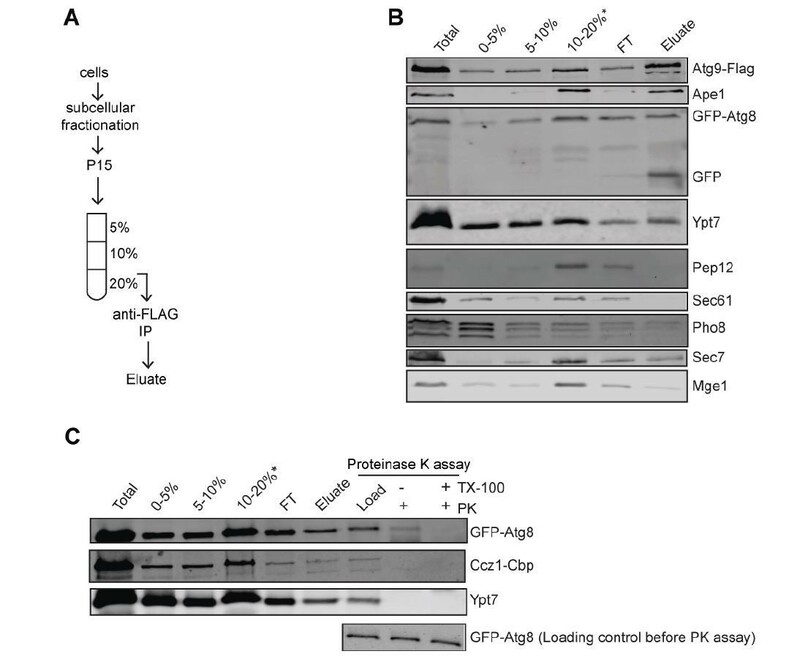 (C) Detection of Mon1-Ccz1 and Ypt7 on autophagosomes by proteinase K-protection assay. Autophagosomes were collected as described in part B. Equal fractions were then treated with 1 mg/ml proteinase K (PK) in the absence or presence of 1% Triton X-100 (TX). Indeed, we were also surprised that the loss of PI-3-P due to the atg14Δ deletion on autophagosomes did not affect localization of Ccz1. In response to the reviewers’ request, we tested for colocalization of Atg8 and Ape1 in the atg14Δ mutant and we could indeed confirm that these two proteins colocalize, probably at the PAS in agreement with previous studies showing that Atg8 is lipidated and present at the PAS in the absence of Atg14 (Suzuki et al., 2001; 2007). Thus, the pool of Atg8 present at the PAS is sufficient for Mon1-Ccz1 recruitment to autophagosomal membranes. We also generated atg2Δ, atg18Δ and atg9Δ mutants and examined colocalization of Ccz1 and Ape1 (Figure 2A). Finally, we placed the actual images for the bar graphs of Figure 2A and B in new Supplemental Figures. We tested whether Vps21 is required for autophagy by fluorescence microscopy (Figure 1—figure supplement 2). Our data demonstrate that the Rab5-like Vps21 does not impair autophagy under nitrogen starvation. As we are not sure if this is due to the selected background strain, we conducted the assay with another strain (SEY6210), though observed the same result. In both strains, Ccz1 was found primarily in the cytosol, yet autophagy was still functional as observed by mCherry-Atg8 in the vacuole lumen. We thus believe that the role of Vps21 is restricted to the endocytic pathway as overproduced Vps21 and Vps8, which results in an accumulation of endosomes proximal to vacuoles (Markgraf et al., 2009), also accumulates Mon1-Ccz1 at this site. However, these conditions do not redirect Mon1-Ccz1 exclusively to endosomes. We do not yet understand the discrepancy to the recent study of Zhou et al. (Zhou et al., 2017), which suggested a Vps21 involvement in autophagy. We suspect that this effect could be due to the selected background strain, and itwill be important to dissect direct from indirect contributions. We like to add that a role of Vps proteins (except for the Vps proteins involved in fusion with vacuoles) in the autophagy pathway is controversial, as they were also not identified in the principal autophagy screens performed by the Ohsumi, Klionsky and Thumm laboratories. We have immunoprecipitated endogenously TAP-tagged Ccz1 from a strain expressing GFP-Atg8 to demonstrate the interaction of Mon1-Ccz1 and Atg8 in vivo. We indeed observed more Ccz1 in complex with Atg8 when cells were starved prior to lysis. This agrees with our model of starvation-induced relocalization of Mon1-Ccz1 to the autophagosomal surface. 1) Characterized Atg8 (I21R), which is impaired in selective autophagy (Figure 2—figure supplement 3). 2) Extended Figure 1—figure supplement 1 by the giant Ape1 assay to provide further evidence that Ypt7 is present on the autophagosomal membrane. 3) Provide evidence that the vps21Δ mutant indeed has an autophagy defect by using GFP-Atg8 instead of mCherry-Atg8, and by employing the Pho8Δ60 assay in Figure 1—figure supplement 2. 4) Demonstrate that Ccz1 mainly interacts with the lipidated Atg8 in vivoby immunoprecipitation of endogenous Mon1-Ccz1 with GFP-Atg8 from wild-type and atg4Δ cells (Figure 2C). We have extended our analysis here using Atg8 I21R mutant. The I21R mutant has a defect in selective autophagy (Ape1 processing), though can support bulk autophagy at least in the background tested here (Pho8Δ60 assay) (Figure 2—figure supplement 3). 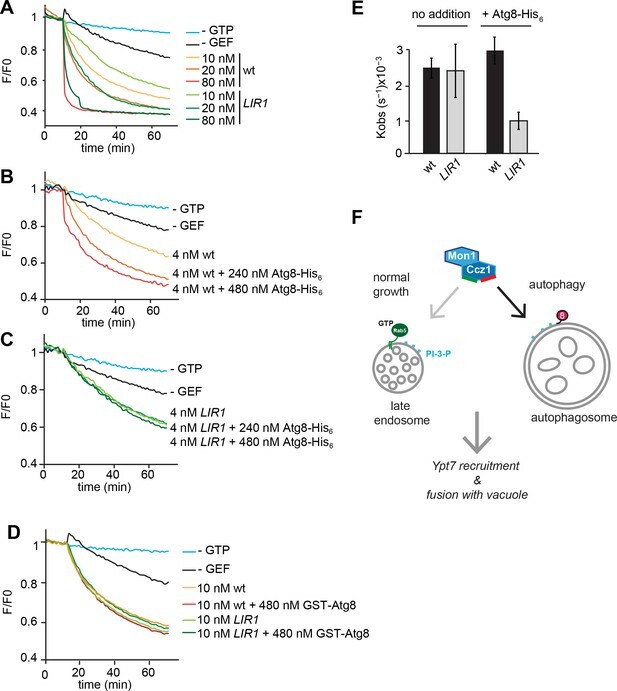 In this sense, it behaves similar to the suggested P52A/P67A mutant of Atg8 (Noda et al., 2008; Okamoto et al., 2012, JBC), which again showed its strongest defect in selective autophagy, while supporting bulk autophagy. We therefore believe that Mon1-Ccz1 recognizes Atg8 also via this site, but may employ additional binding sites in Atg8 for its targeting to autophagosomes during starvation. We would like to note that the diversion of Mon1-Ccz1 from endosomes to autophagosomes during starvation may also require additional posttranslational modifications, possibly even in the vicinity of the LIR motif. The observed loss of Mon1-Ccz1 binding to Atg8 in the two Atg8 mutants may reflect the mode how Mon1-Ccz1 recognizes in part Cvt vesicles, while a possible phosphorylation of Ccz1 or Mon1 could make Mon1-Ccz1 available for Atg8 during starvation. This is certainly an issue that warrants future analysis. We have responded to this criticism in our previous submission and provided the reviewer with evidence of purified autophagosomes contain Ypt7 on their surface. Moreover, Hegedus et al., 2016 showed Rab7 binding to autophagosomes in Drosophila. We thus felt that we had addressed their concern, yet recognize that additional support would be needed. It is tempting to believe that a fluorescent signal is sufficient to also localize a protein by immuno-electron microscopy (IEM). However, the Reggiori group has long experience with yeast and requires at least 1900 molecules/cell to reliably recover an IEM signal. As Ypt7 is not as abundant if not overexpressed, we turned to the giant Ape1 assay to enrich a possible immature structure to visualize Ypt7 by fluorescence microscopy. 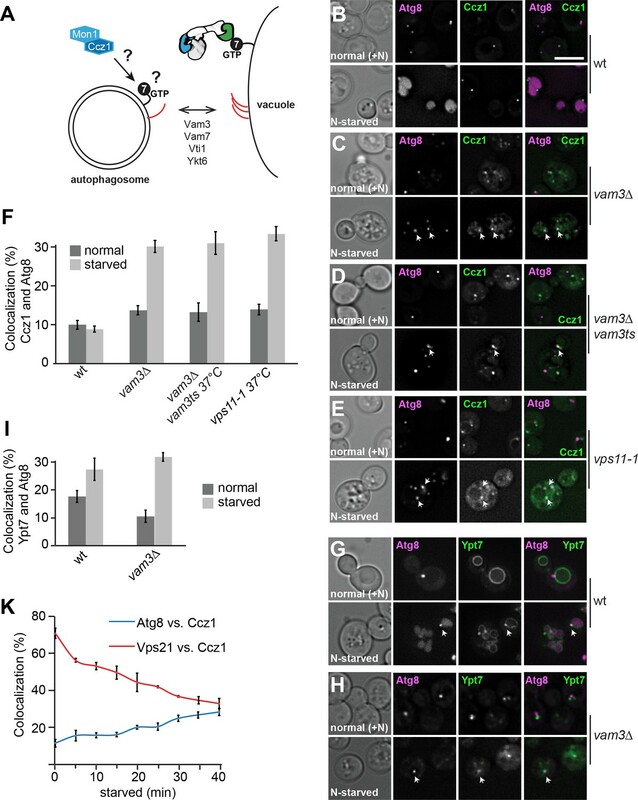 We conducted this assay both under fusion compromised conditions in the vam3Δ mutant, which results in a massive vacuole fragmentation and loss of autophagosome-vacuole contact, and in wild-type. Our data now provide evidence that Ypt7 is found on the cup-shaped isolation membrane as dots in wild-type and vam3Δ background. These data have been added now as Figure 1—figure supplement 1 to the manuscript. Moreover, Yamano et al., 2018 (eLife) just recently showed that MON1-CCZ1 is required for the mitochondrial recruitment of RAB7A during mitophagy in mammalian cultured cells. We have conducted multiple assays to address the role of Vps21 in autophagy, and find as published reduced bulk autophagy in the vps21Δ mutant using the Pho8Δ60 assay. We also observe that Ccz1 poorly localizes to membranes in the vps21Δ mutant and does not concentrate upon starvation. We do not yet know if the loss of Vps21 also impairs Ccz1 targeting to autophagosomes as a high cytosolic signal might not allow us to see the autophagosomal pool. We now have changed the text to adjust our statements here. In response to the reviewers’ comment, we have used the atg4Δ deletion and monitored Mon1-Ccz1 association with Atg8 by pull-down. Without Atg4, Atg8 is not targeted to the autophagosome, even though it is present in cells. In agreement with our interpretation, we only find a greatly enhanced interaction of Ccz1 and Atg8 upon starvation in wild-type cells, whereas this interaction was lost in atg4Δ deletion cells (Figure 2C), which also correlates to our microscopy data that Ccz1 fails to localize to the PAS in all the mutants blocking Atg8 conjugation to PE (Figure 2A; Figure 2—figure supplement 1). Therefore, we conclude that Ccz1 mainly recognize lipidated Atg8 on the autophagic structures. We thank Anna Lürick, Stephan Kiontke, and Claudio DeVirgilio for support and discussion, Sascha Martens and Ivan Dikic for constructs, and Kathrin Auffarth and Angela Perz for excellent technical assistance. DK is supported by the SFB944, Project P17. FR is supported by SNF Sinergia (CRSII3_154421), Marie Skłodowska-Curie ITN (765912), and ZonMW VICI (016.130.606) grants. JG received support by the SFB 944 graduate program. This work was funded by the DFG (UN111/7-3 and SFB 944, Project P11). © 2018, Gao et al.